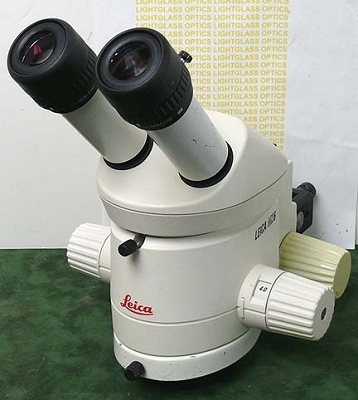 These Leica MZ6 Stereomicroscope w/Focusing Arms are cleaned and relubed. They come with Leica 10445111 10X/21 High Eyepoint eyepieces and Leica 10422563 0.5X Bottom Objectives. They also have the Leica 45-degree binocular head and Focusing Arm. This arm has the standard 5/8" diameter mounting pin that can be mounted in most any Boom Stand or OEM mount. The 0.5X Objective increases the working distance under the microscope to about 5 inches, so you can get your hands under the microscope for work. This objective also reduces the magnification by half, so with the included 10X eyepieces, the continous zoom ranges from 3.15X to 20X. This microscope is a modular system, and eyepieces and objectives can be easily exchanged to suit the user.